Long time no see! My summer research job with pediatric plastic surgery turned into a lot more than I bargained for, and that's a wonderful thing. So far in these past two weeks I have been in cleft palate clinic thrice, watched two surgeries, dug through stacks of literature, tinkered with new tech, and met some awesome kids (and adults, too). Every single day is a new adventure that I'm juiced for. Working at a hospital and clinical research means no blue jeans or tshirts, so I have to find a way to dress for the baking humid commute and the chilly air conditioning. 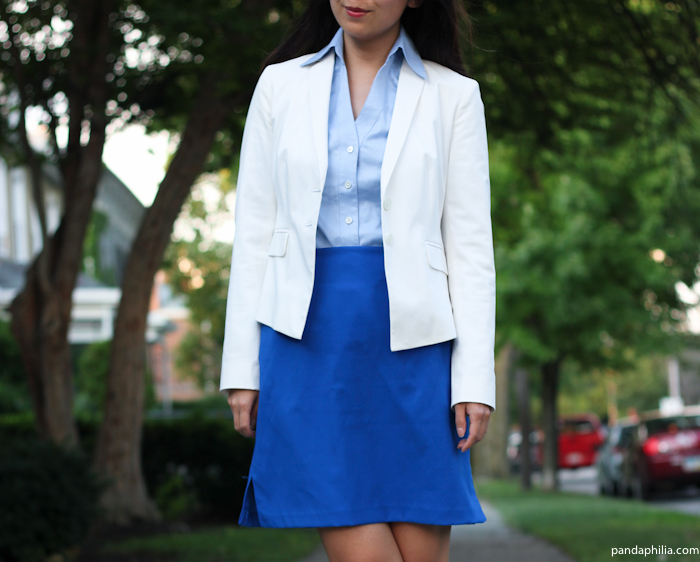 A button down and skirt are standard for me by now - simple to throw on and professional. A couple of weeks ago I went to a Goodwill near campus and was pleased to find a big variety of on-trend small pieces. Downside was a slightly higher price tag ($7 for a sundress) for a thrift shop but the never-before-worn or designer items made it worth it. This top was a welcome teeny Ann Taylor discovery in 2Petite that fits me well. 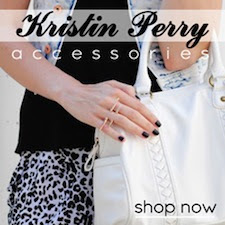 It is of a thicker soft cotton material and has tiny vertical stripes for a whole $4. 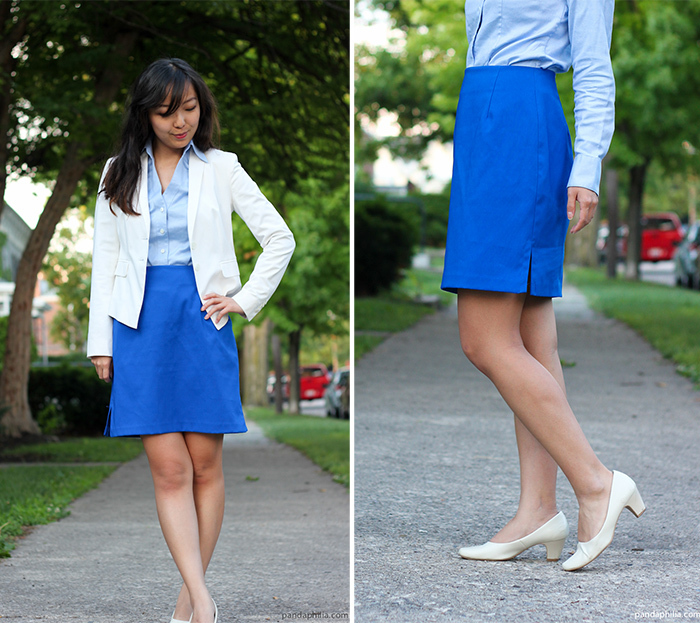 The cobalt blue skirt hits right above my knee and fits at the waist, also for $4. It has side slits but my coat covers it. 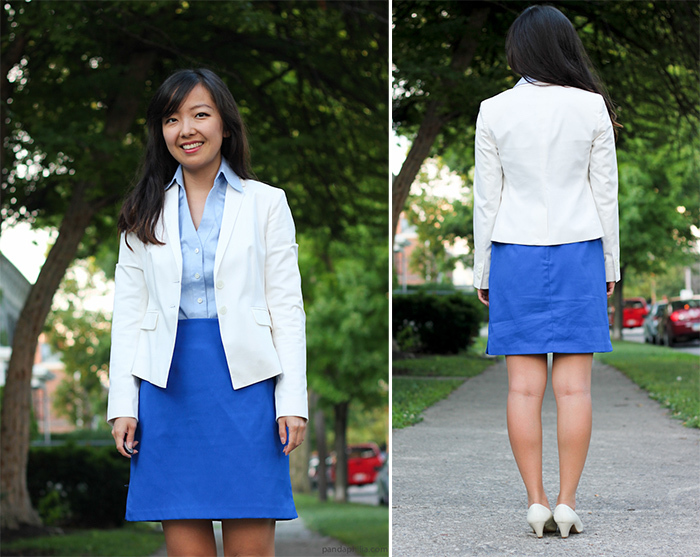 The white blazer is going to simulate my white coat and the whole look reminds me slightly of flight attendant. Off to late night life on the town and catching up with friends! Warm nights, firefly lights, maybe a sip and a munch in hand too. C'est la vie! 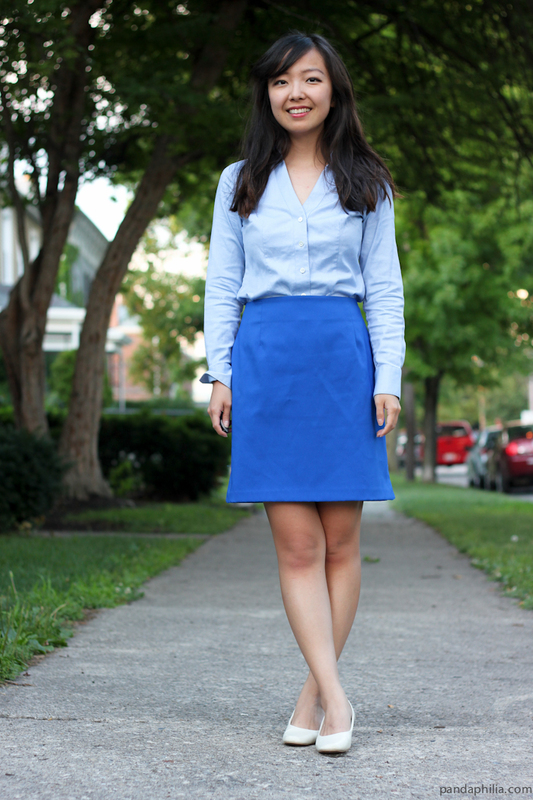 Love that you have a summer "uniform" that is both professional and comfortable. I love the blue on blue. That's a cute outfit. I've also been trying to find something I can wear in the summer to my hospital jobs. I'm really struggling with what to wear when I go to India though. I'm doing some shadowing and research in a hospital. I have no clue what I'm going to wear there.